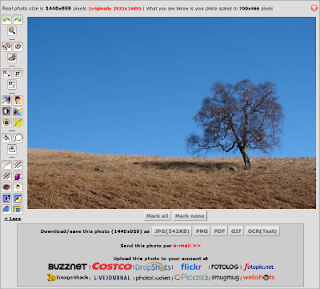 Phixr is another addition to the growing list of free, web-based image and photo editors available, such as Picnik, Snipshot, Pixenate, Fauxto and Preloadr. Phixr isn't new. It's a year old and, while I obviously missed it as it grew up, it's developed into a very useful editing tool over that year. As well as being able to upload images from your local hard drive, Phixr will let you upload images directly from an account on image hosting sites such as Flickr, fotopic.net, Photobucket, Picasa Web Albums, SmugMug and WebShots. As well as the basic photo editing tools like resize, crop, rotate, flip and remove red-eye, you can also adjust brightness, hue and saturation, or convert to black and white and sepia. On top of that you can enlarge the canvas (add margins), add a border or frame, add text, round corners, add a speech bubble or even fill an area with colour. You can even mix and blend the photo with others. It also has some more advanced tools such as sharpen, blur, despeckle (pixel-noise removal), negate colours, adjust RGB values or blend in another colour or add a lomo effect. Then there's the 14 filter effects you can apply as well, such as pop art, charcoal drawing, emboss, sphere, etc. Once you've finished editing, you can download your image in JPG, GIF, PNG, PDF or even OCR (text) format. You can also e-mail it or upload it to a host of destinations such as Buzznet, Costco, DropShots, Flickr, Fotolog, fotopic.net, ImageShack, LiveJournal, Photobucket, Picasa Web Albums, SmugMug and WebShots.